The One Cool Blow complex at night. The One Cool Blow Homeowners’ Association (HOA) represents business and residential tenants and their renters in three modern buildings in the emerging NoMo section of Charleston, S.C.
One Cool Blow takes pride in being a progressive condominium complex catering to young professionals. Our HOA rules and regulations are designed to promote our values: sustainability, “green” living, respect and courtesy towards neighbors, and respect for one’s home. This website offers information for owners and renters with Frequently Asked Questions, public HOA documents and HOA rules, including information on parking, pets and garbage. The site also offers documentation and rules for owners who wish to lease their units. If you have any questions about the HOA, its board, its rules or common area maintenance, please contact Charleston Green Commercial. 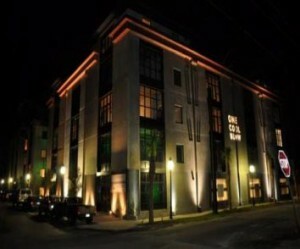 One Cool Blow takes pride in being a fun and progressive condominium complex catering to young professionals. FAQ: How can we be better neighbors? Copyright 2015, One Cool Blow Homeowners Association. All rights reserved. For more information about our association, contact our manager, Courtenay Brack, at CharlestonGreenCommercial.com.